Everything Changes – The Guide to Young Adult Cancer » The drawbacks of being a know-it-all cancer patient. The drawbacks of being a know-it-all cancer patient. I have always been a geek for research, and often on dark topics. In tenth grade I wrote a 15-page paper on infanticide in China. In eleventh grade, my English term paper was on Sylvia Plath’s suicide and her parents’ holocaust experiences. I have no idea why I tend to such morbidity; I am really a very happy person. When I was diagnosed with cancer at 27, it was second nature for me to dive into research and learn as much as possible about my disease and supportive resources. My surgeon joked that I could join his fellows on rounds. Oncology social workers often commented that I knew more than they about the benefits available to me. I’ve earned a reputation as someone good at helping people make sense of recent diagnoses. I am asked regularly, by strangers, friends and family, to gather information that will lead to efficient and sensible care in hopes of alleviating their suffering. I am so used to people wanting my help that for the first time, I have approaches to a family member’s heinous medical condition and nobody is interested in my findings. Inside I am a four year old throwing a temper tantrum shouting, ‘Listen to me! Listen to me!’ How do doctors deal on a daily basis with patients ignoring their prudent recommendations, opting instead for poor health choices? It isn’t that my ego can’t handle it; It’s my heart that’s having a hard time not being able to lessen the pain of someone I love. I cringe at spiritual jargon, yet a few times today I have thought of the serenity prayer. You know, the shtick about accepting the things you cannot change. I’m also thinking of the cliché horse whom you can lead to water but you cannot make him drink it: You can lead a patient to a great list of top docs but you cannot make them call. As a young adult cancer patient, people have offered me unsolicited advice, mostly about alternative and natural medicine. Their well-intentioned suggestions make me want to smack them upside the head. And, even though my suggestions to others are based on science, clinical trials, and the highest standard of care, when my ideas are unsolicited, I supposed they too want to smack me. It is hard to accept that people we love are just going to lead the lives they want, not the ones we want for them. 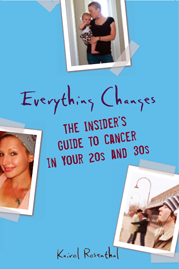 For tips on how to conduct smart research about your disease, check out my book Everything Changes: The Insider’s Guide to Cancer in Your 20s and 30s.